Use SignalFx to monitor AWS Auto Scaling via Amazon Web Services. To access this integration, connect to CloudWatch on the SignalFx Integrations page. SignalFx provides built-in dashboards for this service. Find them on the Dashboards page in SignalFx. 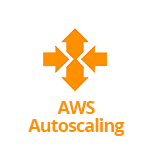 For more information about the metrics emitted by AWS Auto Scaling, visit the service’s homepage at https://aws.amazon.com/autoscaling/.